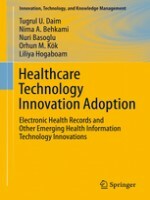 This book aims to study the factors effecting the adoption and diffusion of Health Information Technology (HIT) innovation. It analyses the adoption processes of various tools and applications, particularly Electronic Health Records (EHR), highlighting the impact on various sectors of the healthcare system, such as physicians, administration and patient care, while also identifying the various pitfalls and gaps in the literature. With the various challenges currently facing the United States healthcare system, the study, adoption and diffusion of healthcare technology innovation, particularly HIT, is imperative to achieving national goals. This book is organized into three sections. Section one reviews theories and applications for the diffusion of Health Care Technologies. Section two evaluates EHR technology, including the barriers and enables in adoption and alternative technologies. Finally, section three examines the factors impacting the adoption of EHR systems. This book will be a key source for students, academics, researchers, practitioners, professionals and policy-makers.